Oh, and Shane McMahon is 'the best in the world' now. Friday is generally a good day to bury bad news and when you add in an already super-charged controversy to the mix, what better time to bring Hulk Hogan back into the fold? The Hulkster was dismissed from WWE and stripped of his 'Legends' status in July of 2015 after a court transcript revealed his use of racist remarks. Hogan subsequently apologised for using "language that is offensive and inconsistent in my beliefs" and so began his chance for redemption in the strange world of professional wrestling. All can be forgiven when there's money to be made, you see, and thus it was really only a matter of time before Hogan returned to the company that he made famous. The first event; April's Greatest Royal Rumble, was heavily criticised for appearing to be little more than a propaganda exercise for Saudi Arabia and how apparently progressive things are now under the current leadership. With the Crown Jewel event, WWE eventually made the decision to go ahead, transparently citing business reasons in their "very difficult decision" to proceed with the show. 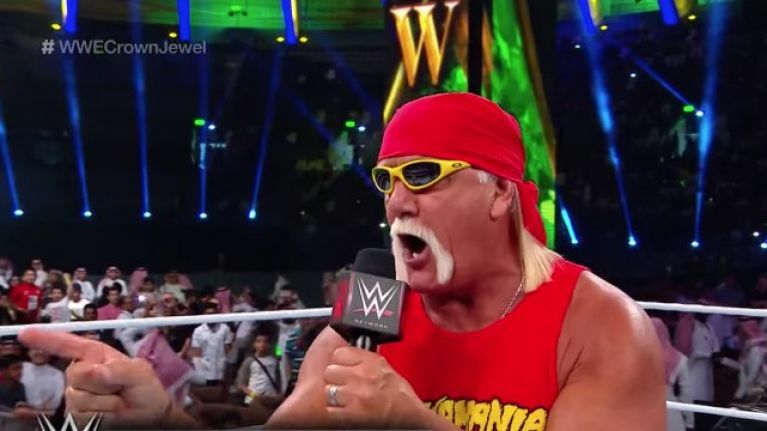 Superstars John Cena and Daniel Bryan both pulled out of Crown Jewel, and Hulk Hogan was later announced as the official host. And so, on Friday 2 November, the event went ahead as planned. The big talking points; Hulk Hogan emerging at the start of the broadcast to his 'Real American' theme - a genuinely surreal sight and sound given the location and surrounding circumstances - and Crown Jewel ending with a McMahon standing tall for some reason. Check out Hogan's big return, in which he said basically nothing of consequence, below. As for the rest of the show; Brock Lesnar won the vacant Universal Championship after what essentially amounted to a squash match with Braun Strowman, who was heavily expected to win. So that one made little sense. Then you had the World Cup tournament - "to determine the best in the world" as WWE kept repeating in the weeks of build-up - come down to The Miz (Smackdown) and Dolph Ziggler (RAW) only for an injury to rule Miz out. So, Ziggler wins, right? No, for valiant Smackdown General Manager and part-time wrestler Shane McMahon stepped in and... won the final of a tournament that he wasn't previously in and is thus now 'the best in the world'. By all accounts, the wrestlers very visibly phoned in their night's work as WWE announcers referred to 'Riyadh' rather than 'Saudi Arabia' throughout.